Stricter environment standards have put the brakes on the entry of Mexican trucks into US soil under the North American Free Trade Agreement (NAFTA). The agreement calling for the free movement of trucks between US, Canada and Mexico should have begun in December 1995. The US has postponed the implementation until it becomes satisfied that Mexican trucks fulfilled US environmental and safety standards. 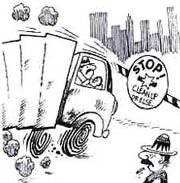 Truck drivers in Mexico are paid by the job and to rake in hicre, they periodically violate many traffic rules. On the other hand, in US, truck drivers have to work only fixed hours a day. This has led to the Teamsters, the truck drivers' union in US, arguing that their jobs could be taken by the Mexicans. The US postponement on the issue has raised a comment from the Mexican authorities who hoped that the free trade agreement could overcome the current economic slump which the country finds itself in.